If New York Times journalist David Sanger’s new book on President Obama’s foreign policy is accurate, Obama is increasingly frustrated in his efforts to develop a better relationship with China. His senior aides place all the blame on their Chinese counterparts. The President may also want to look a little closer to home. The broader debate we have been having for three years in the administration internally is how can we make it compelling for the Chinese to move more aggressively to try to accommodate our concerns. They’ve been moving, and when they think it is completely in their interest they’ve been moving with alacrity. But where they may have some sympathy for our view but there are huge internal fights, they are only doing as much as needed to buy some peace. This suggests a pretty one-sided view of the relationship. 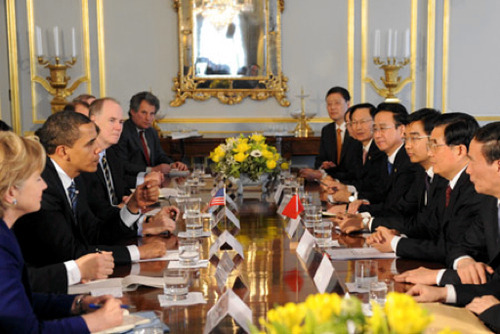 There is no apparent sense of a need for reciprocity among Obama’s China hands. The administration’s effort to get China to start talking about its military space programs provides an insightful example. The Obama administration wants to talk with China about its anti-satellite weapons programs. China’s sole condition for agreeing to preliminary arrangements for the talks is for NASA to honor President Obama’s personal commitment to Chinese President Hu Jintao to host a delegation from the Chinese Manned Space Engineering Office in the United States. But the Pentagon, the State Department and the China hands on the National Security Council refused, claiming the Chinese request was an unwarranted and unacceptable precondition for beginning bilateral discussions about space security issues. This despite an awareness that the same organization that runs the Chinese human spaceflight program, the General Armaments Department of the PLA, is also responsible for the testing of Chinese anti-satellite weapons. The Chinese had already hosted the NASA Administrator in China during the fall of 2010 under an agreement for reciprocal visits reached during President Obama’s visit to China a year earlier. The Chinese were asking for the U.S. to hold up its end of the agreement. A critical factor in the Obama administration’s unwillingness to order NASA to host the Chinese is Congressman Frank Wolf, who chairs the appropriations subcommittee that funds NASA. Wolf takes a hard-line on China on human rights grounds and was furious with NASA administrator Bolden for not consulting him before the China visit. The congressman exercised his anger by inserting language into several appropriations bills prohibiting NASA from spending funds on any form of contact with its Chinese counterparts. Obama’s advisers told Sanger they were frustrated with the Chinese leadership’s inability to overcome internal political opposition from hard-liners who could not be “compelled” to “accommodate” the concerns of the United States. At the same time these aides were unwilling to entertain a Chinese request for President Obama to stand up to his own hard-liners in order to honor an obligation he made to the president of China. It is not surprising that even “accommodating” Chinese officials are just as frustrated with the United States as the Obama administration appears to be with China.